How do I delete a single document from my bundle in Bundledocs? 1. 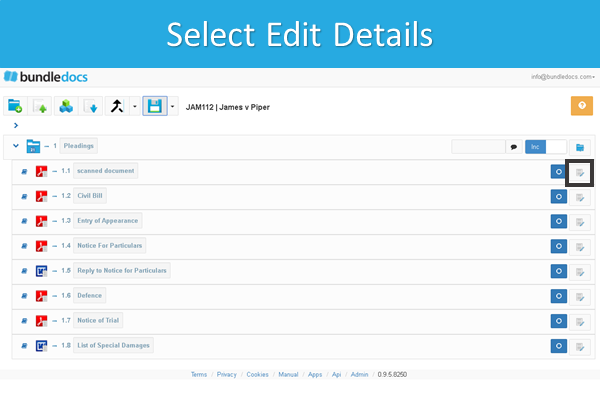 Select 'Edit Details'. The 'Edit Details' icon is located to the right of any document uploaded. 2. A window will then appear. Select the red 'Delete' button. 3. That's it. Your document is now deleted from your bundle. Remember if you do not want to delete your uploaded document, it can be easily excluded. Any excluded document will remain in your account but will not appear in your generated bundle. This is great as it gives you the opportunity to include this document again if required. Want to learn how to include/exclude individual documents within Bundledocs? 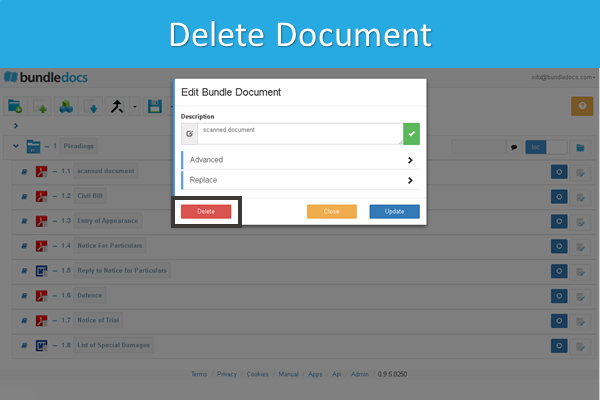 Check out our 'How to Exclude a Document from your Bundle' post and learn how today!